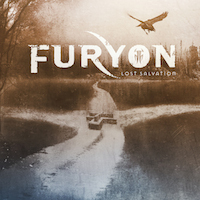 It has taken a few years, but now FURYON are back. I was never too happy with “Gravitas” from 2012, maybe it was simply a case of not expected from that record company? The band consists of Matt Mitchell, vocals, Alex “Nickel” Bowen, bass, Lee Farmery on drums, and guitarists Luca Faraone and Tiago Rosado. This time around I really find FURON exciting and booming. Opener “All that I Have” may be almost pop and rap in the opening part, but then the groovy rock kicks into gear - which is exactly what this lot is all about. They might be almost stoner at times (e.g. “Scapegoat”), or sensitive as in “What You Need” or halfway to FAITH NO MORE as in “Resurrect Me”. They still return to timeless rock or at least organized havoc. I really like the title track with its frenetic opening, the epic sense of doom in “Good Sky”, the sensitive yet hypnotic and mesmerizing “What You Need” and the exception from my rule of no voice experiments “Left It with the Gods”. The rest isn´t bad either and the gritty guitar work rules throughout! This is one to discover, even for those of us who deep down believes that the best music was made in the eighties and nothing worthily has been done since.